Canterbury Tower implemented NV900 units in the hallways, dining room, and activity area in October 2015. In February 2016, they began implementing bedside NV200 units for each new admission, readmission, and any residents identified with any type of infection. 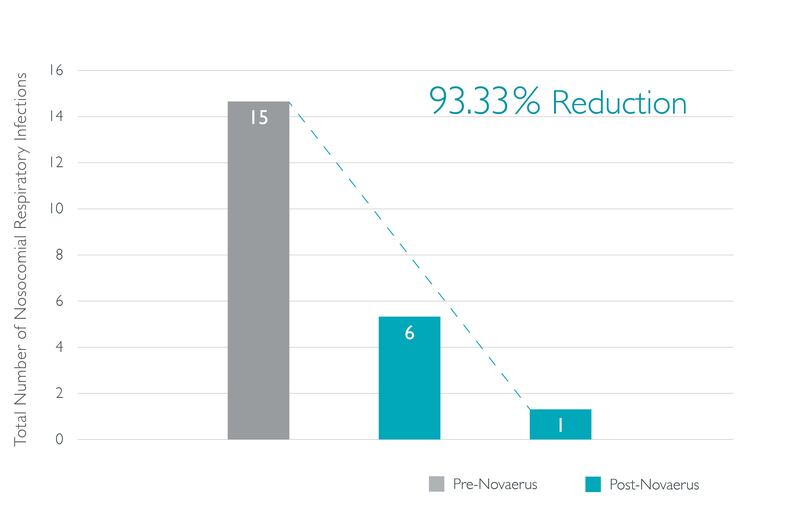 This study compares the total number of respiratory nosocomial infections and infection rates before and after each implementation of the Novaerus technology. A 35-month review was conducted to evaluate the results of implementation. A Nurse Risk Manager Consultant visited the facility for two days to abstract information and review the data. The periods selected for initial pre- and post-Novaerus review were October 2013 through September 2014 and October 2014 through September 2015. Data for two consecutive 12-month periods were available and included to reduce the risk of skewed data related to seasonal variances. The implementation of individual Novaerus units in targeted rooms began in February 2016. A period of seven months, February through August of each year, was selected to provide equivalent seasonal timeframes for comparison of each of the different configurations of the Novaerus technology. In the 12-month period after the initial implementation of the NV900 units in shared areas, the total number of nosocomial respiratory infections at Canterbury Tower decreased from 31 in 2014 to 24 in 2015, a 22.58% reduction. In the 7-month period after implementation of the individual NV200 units in targeted patient rooms in February 2016, the total number of nosocomial respiratory infections decreased from 15 in 2014 to 1 in 2016, a 93.33% reduction. In the 7-month periods after initial implementation of the NV900 units and the individual NV200 units in patient rooms, the overall number of nosocomial respiratory infections decreased from 6 in 2015 to 1 in 2016, an 83.33% reduction. The respiratory nosocomial infection rate for the three similar 7-month sample periods decreased each year: 2.48, 0.96, and 0.20, respectively.